If you want to enjoy a slice of Europe on the Las Vegas Strip, NoMad Hotel at Park MGM is the place for you. Known worldwide for their luxurious locations in New York and Los Angeles, NoMad Las Vegas brings their trademark elegance and service to the heart of Sin City. Quality restaurants and swanky bars dot the resort. Designed by French architect and designer, Jacques Garcia, at the NoMad offers unparalleled comfort and style. Rooms and suites come loaded with custom furnishings, original art and spacious storage spaces to really make you feel at home. NoMad offers an unmatched Las Vegas experience. Visit today. The hotel requires $100 per day for the incidental fee/security deposit. 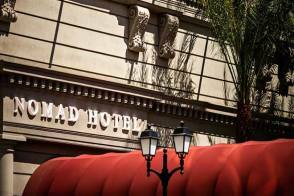 Resort fee NoMad Las Vegas has a $41.95 per room, per night resort fee. This fee is not included in your reservation and will be collected by the hotel. This 700-square-foot non-smoking room features one king bed with custom linens. In addition to bespoke furniture, the room also has oak hardwood floors and a mahogany writing desk. Guests will also have access to high-speed Wi-Fi and complimentary use of the 24-hour fitness facilities. The bathroom has a freestanding pedestal tub and a walk-in shower with marble mosaic tiles. This 528-square-foot non-smoking room features one king bed with custom linens. In addition to bespoke furniture, the room also has oak hardwood floors and a mahogany writing desk. Guests will also have access to high-speed Wi-Fi and complimentary use of the 24-hour fitness facilities. This non-smoking room features two queen beds with custom linens. In addition to bespoke furniture, the room also has oak hardwood floors and a mahogany writing desk. Guests will also have access to high-speed Wi-Fi and complimentary use of the 24-hour fitness facilities. The bathroom has a walk-in shower with marble mosaic tiles. This 690-square-foot non-smoking room features two queen beds with custom linens. In addition to bespoke furniture, the room also has oak hardwood floors and a mahogany writing desk. Guests will also have access to high-speed Wi-Fi and complimentary use of the 24-hour fitness facilities. This 406-square-foot non-smoking room features one king bed with custom linens. In addition to bespoke furniture, the room also has oak hardwood floors and a mahogany writing desk. Guests will also have access to high-speed Wi-Fi and complimentary use of the 24-hour fitness facilities.